The Otto Bulldog has a flat, broad head that is squared with a 3 to 4 inch squared muzzle. Colors include white with maximum of 80% percentage black brindle, red or brown with no black mask, or all white acceptable. Color disqualification: ny form of blue, grey or merle. Black pigmentation only anywhere on body and especially on the nose, eyelids and lips. Eyes: any shade of brown; blue is a fault. Ears: natural preferred, pricked or flapped over; cropped acceptable. Tail: natural or docked at first joint. The Otto Bulldog is outgoing and friendly, yet a natural family guard dogthat is at home in the country or in the city. Respectful and very trainable, this breed will fight to the death to defend its owner and makes an excellent companion dog. Excellent with and protective of children. These are active, athletic and mindful dogs with a lot of heart. The objective in training this dog is to achieve pack leader status. It is a natural instinct for a dog to have an order in its pack. When we humans live with dogs, we become their pack. The entire pack cooperates under a single leader. Lines are clearly defined and rules are set. Because a dog communicates his displeasure with growling and eventually biting, all other humans MUST be higher up in the order than the dog. The humans must be the ones making the decisions, not the dogs. That is the only way your relationship with your dog can be a complete success. Otto Bulldogs will do okay in an apartment if they are sufficiently exercised. They are very inactive indoors and will do best with at least an average-sized yard. These athletic, active dogs have an average demand for exercise. They need long daily walks and will enjoy a romp in a safe, enclosed area. Little grooming is needed. Occasionally comb and brush to remove dead hair and cut down on shedding. Bathe once every two weeks. This breed is an average shedder. 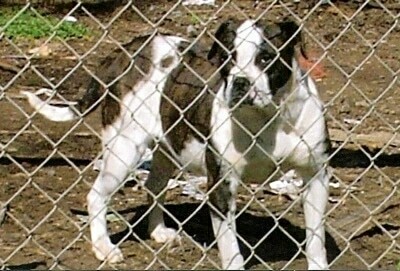 The Alapaha Blue Blood Bulldog was established and maintained by Lana Lou Lane during the 1980s. The breed maintained a relative consistency up until the time of Lana's house fire when she lost Marcelle and was severely burned herself. After this time, the breed took a turn for the worse and continued spiraling down until Lana's death in 2001. Since that time, the ABBB has fallen out of the control of the Lane family, now no longer representing Lana's vision. These changes are the direct result of the ABBB being crossbred with other bull-breeds such as the Olde English Bulldog, English Bulldog and American Bulldog to name a few. The original standard first written by Lana has been modified time and again to allow for these drastic changes in the breed. After many years of contemplation, Ray Lane decided it was finally time to return the Otto to its original form and function, like the Ottos belonging to Papa Buck Lane. The Otto is the Ol’ timey plantation dog of Lana Lou Lane's grandfather that she attempted to perpetuate, yet went astray by infusing various breeds. The Otto Bulldog redevelopment program is a recreation of Papa Buck's Ol’ timey plantation dog using the same local stock of White English Bulldog used by Lana's Lou Lane to create her breed, the Alapaha Blue Blood Bulldog. The Otto Bulldog does not include outcrosses to Colby Pits, Catahoula, Olde English Bulldogs, or American Bulldogs, among others. The Otto Bulldog is a completely separate breed developed by Ray Lane. An official standard for the Otto Bulldog has been established by Mr. Lane in order to return them to their original form and function. The Otto Bulldog is recognized and registered with the Backwoods Bulldog Club. Registration of purebred Otto Bulldogs is strictly enforced by Ray Lane and the BBC.